Many of us dream that we can live by the beach all year round but sadly, not all of us are able to achieve this. However, you don’t have to fret because you can give your dining room some beachy vibes along the way so that you can feel like you are on vacation even when you are just eating in your home. Here are some really cool coastal ways to incorporate those nautical aspects into your dining room. 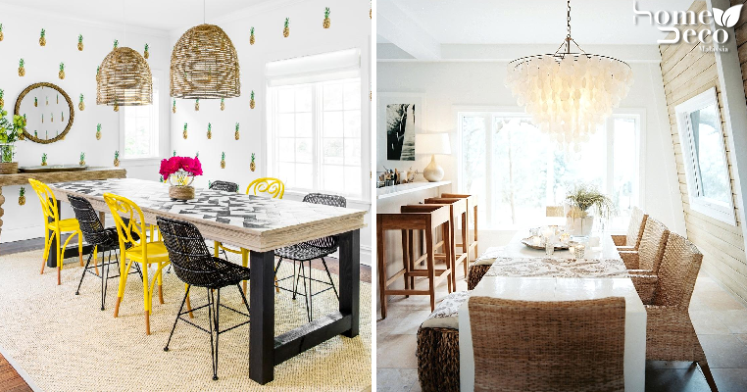 The beach would not be as fun without some sun and a great way to evoke the beachy atmosphere is to make your dining room bright and cheery. Here, the predominantly white dining room uses some pastel colours to soften the effect of the sunny yellow accessories in the room. Having a chandelier in your dining room makes it look stylish but to really inject some coastal vibes into your home, switch out the usual chandelier with one made out of seashells that will look super whimsical. The natural wooden elements help to warm up the room as well. Homes on the beach are known for being quirky, fun and casual so you can let your creative juices flow when choosing patterns. This funky dining room uses an unusual pineapple patterned wallpaper to liven up the room while pops of vibrant colour complement it perfectly. Rattan material is known to be durable and trendy which is why they are normally used for outdoor furniture. Think out of the box by using some rattan furniture in your dining room for a casual coastal feel and do choose light wood for an airier-looking space. One of the easiest ways to add some of that nautical feel into your dining room is to use obvious beach accessories such as anchors, marine life forms, seashells and even a life preserver to decorate your dining room. This space is a perfect example of tasteful decoration using oceanic elements.